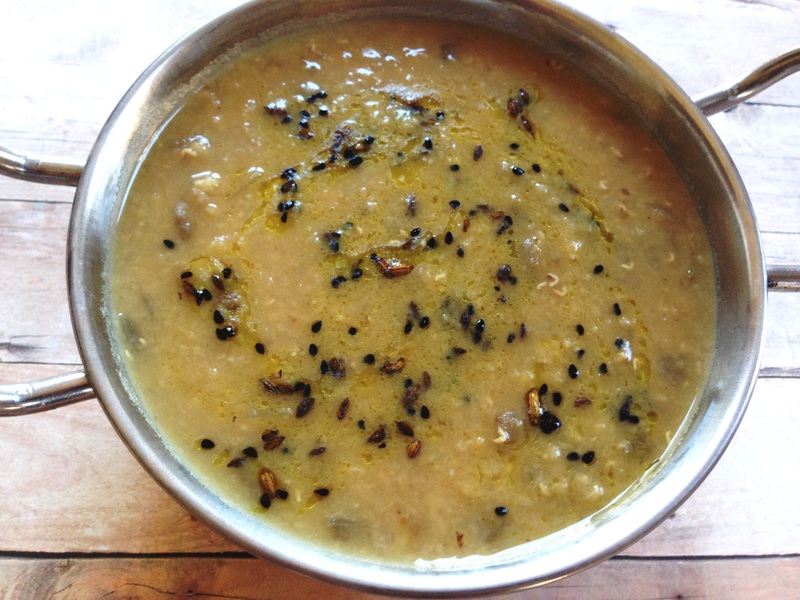 Mustard oil and the combination of spices give this dal it’s yummy Bengali flavor. This dal is also just a tad bit sweet. Mustard oil can be found at the Indian market. They all seem to say not for consumption, but there is definitely a difference between the kind you use for hair and the kind used in cooking! The kind in cooking has a very astringent mustardy smell. Ask at the store and they should be able to tell you which one is good. I used a mixture of cumin, nigella, fennel and fenugreek, but you could also use the Bengali spice mix panch phoron which includes all the ingredients I used plus mustard seeds. They are basically the pickling spices. I wasn’t feeling like mustard seeds this time, so I left them out. Nigella seeds (kalonji) and fenugreek seeds (methi seeds) are a little more obscure spice, but available at the Indian market. Masoor dal is red when dry and turns yellow once cooked. You can find it in an Indian market. The cool thing about it is that it is a pretty quick cooking lentil and won’t take too long if you don’t have a pressure cooker. In a pressure cooker it only takes 5 minutes. Jaggery is unrefined sugar from sugar cane, dates or palm sap. Jaggery and palm sugar aren’t considered the same ingredient, but I’m guessing that if you have jaggery made from palm sap it probably is the same! I feel terrible, but I can’t find my inspiration for this recipe! I’m pretty sure it was an online recipe, but I can’t find it anywhere and I actually wrote this post a while back (catching up on posting!). In a pressure cooker saute onions until browned, adding garlic part way through cooking. Add the jaggery, dal, turmeric, chili powder, and water. Cover and cook on high until the first whistle, then turn down to medium and cook for 5 minutes. In a tadka or other small pan, heat the rest of the mustard oil and temper the cumin, nigella seeds, fennel and fenugreek until the cumin seeds brown. Add tempered spices to dal and salt to taste.